Front row : Mary Gouldburn nee Town holding Goddaughter Susan, Anna Neal nee Town holding Goddaughter Lynda, Marg Eakin holding Goddaughter Jennifer. 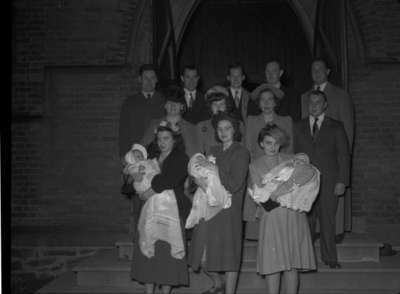 Town Christening, 1948, Marjorie Ruddy. Whitby Archives A2013_040_1241.